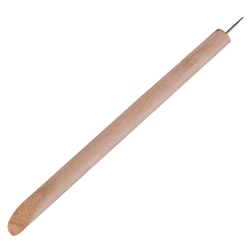 Unique wood tool that aids in applying vinyl in corners and compound curves with a needle on one end to pop trapped air bubbles. Also, the needle can be used to weed very small vinyl lettering and graphics. Packaged in a plastic tube.